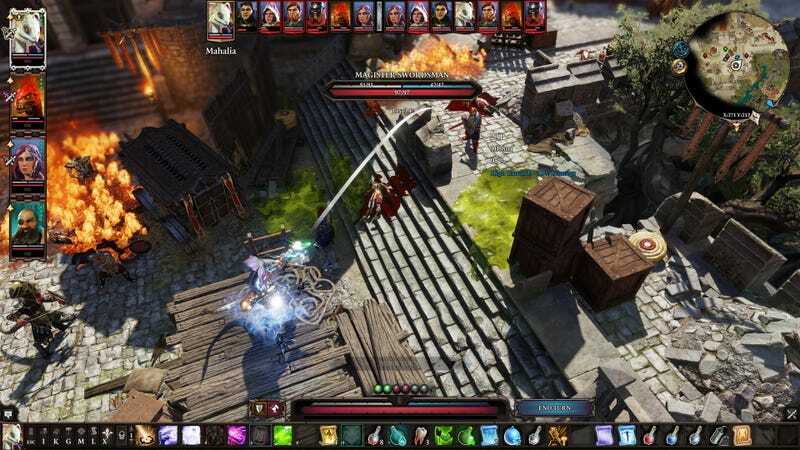 Divinity: Original Sin 2 might look like a sparkly new take on creaky old PC role-playing games, but it’s built atop a foundation of intricately interlocking systems that allow for even more possibility than the classics. Here’s a case in point. Players have discovered that a particular characteristic, undead, and a handful of selectively-applied abilities can create infinite damage loops in combat (or at least near infinite; nobody’s been able to figure out if it ever terminates before killing enemies). This doesn’t seem to be a bug, but I doubt the developers intended these particular abilities to be used this way, either. Wanna know why this is possible? You might want to sit down and maybe dig out a graphing calculator. First, you’ll need an undead target without any physical armor (just HP). The lynchpin in all of this is that undead characters don’t work like other characters in Original Sin 2. They take damage from healing spells and items and can only heal through poison or necromancy skills. Next, have a character cast an ability called Soul Mate on your undead foe so that they’ll receive half of any healing that the caster receives. Remember: this healing will be considered damage to the undead character. The caster also needs at least one point in the Necromancer class so that they’ll receive healing any time they deal damage directly to somebody’s HP. If you targeted an undead enemy, this will just kill them in a single turn. Easy peasy. But what if you want to hit a non-undead enemy with this preposterously powerful combo? Well then you bring another ability into the mix: a Necromancer skill called Shackles of Pain, which causes an enemy to take all the damage one of your characters takes. Have an undead ally cast that on an enemy, then perform the combo on your ally. Piece of cake! Extremely complex, highly fatal cake.